In Outlook, navigate to the calendar tab. 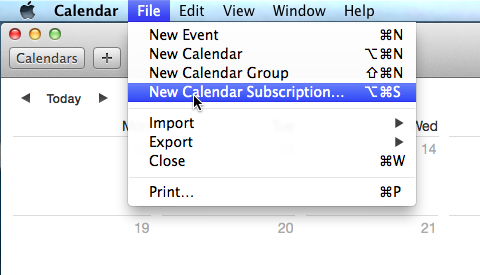 On the Other Calendars tab, right click and choose Add Calendar > From Internet. To change the name of the calendar, right click on the calendar name and choose Rename Calendar. Type the name of the calendar as you want it to appear in Outlook, and then click OK.
See also Microsoft’s instructions or instructions for subscribing from Outlook for Mac. Paste this as the Link to calendar, name it, and click Save at the top. On the next screen, edit the name, etc. and choose the auto-refresh frequency (from every 5 min. to every week). Click OK.
See also instructions from Apple. If you’d like to have iCloud to push a Teamup Calendar feed to all your Apple devices, subscribe it on your Mac (not on iPhone or iPad), make sure to choose “iCloud” as the Location as described here. Enter or paste this feed URL in the field “Server” on the Subscription page. Tap Next. If you want to enable reminders, turn on the Events Alerts (make the button green so that you can set up reminders) and done.